Lyon Saint Exupery Airport (LYS) is the gateway to Lyon and the Rhone Alps region, supporting a thriving tourism industry and offering a selection of hotels. The city of Lyon is not only a popular tourist destination, but it is also an important transport hub and a base for many French and European companies. Whilst accommodation in and around the city of Lyon is plentiful, finding available rooms can be problematic, so advance reservations are a good way to ensure to you do not pay over the odds for basic accommodation. There are several hotels, motels and inns situated near Lyon Saint Exupery Airport, a number of which provide good business facilities. A large number also offer further amenities such as swimming pools, fitness centres and restaurants. Some of the nearby hotels are the Ibis Lyon Est Bron Montchat, Comfort Inn Kiotel and Hotel Kyriad. The onsite airport hotel is Sofitel Lyon Aeroport and it can be accessed via Level 1 of the connecting hall. Many hotels lie in the city centre, just 24 km / 15 miles west of Lyon Saint Exupery Airport (LYS). The most popular accommodation in this area can be found in both Bellecour and Perrache, which can be quick to fill up during busy times. Further hotels are located around the Terreaux area, such as the St. Pierre des Terreaux along Rue Paul-Chenavard. 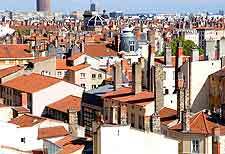 Those planning to stay in Lyon on a small budget should consider visiting the CROUS offices along the Rue de la Madeleine, who can often arrange student accommodation and similar inexpensive lodging. Also worth considering are the HI Hostel Vieux Lyon on Montée du Chemin Neuf, the HI Hostel on the Rue Roger-Salengro, and the Centre International de Séjour de Lyon off the Boulevard des Etats-Unis. The city's tourist information office will also be happy to assist with finding available accommodation and provides a popular reservation service. Noteworthy hotels in the city of Lyon include the Alexandra on the Rue Victor-Hugo, the De la Marne along the Rue de la Charité, the St. Vincent on the Rue Pareille, and the two-star Victoria Hotel along the Rue Delandine, close to the Perrache station.